I put in new door moulding around a door. The new moulding was a little bigger than older moulding which resulted in my cutting the baseboard/shoe moulding with oscillating saw. I am left with a small gap less than a 1/4-1/2 inch. 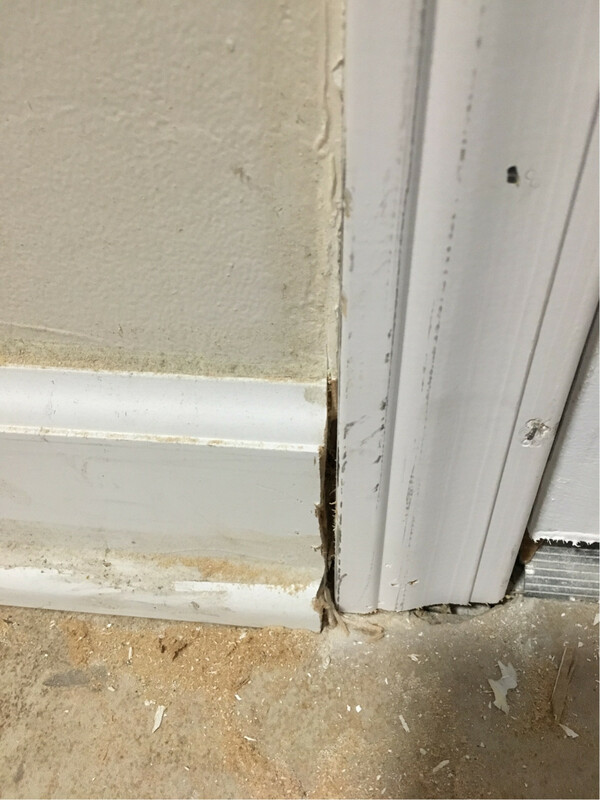 What is best way to fill the gap so that new door moulding is flush with baseboard/shoe moulding? I'd use a non-shrinking wood putty. Caulk and white glue shrink badly, meaning you'll have to apply it multiple times. Mix up some powdered putty and use a putty knife to shape it to your molding. Let it fully cure and skim it again if necessary. Sand and paint. Next time, set your door in place (ideally you'd set the door without casing attached and then set the casing), trace the new casing edge, and remove the door. Score the trim with a knife to create a clean, sharp line, then make your cut outside that line. I would fill the gap, I usually save fine sawdust for this reason and mix with wood glue and pack the space, calking would also work just make sure it is paintable. I like the sawdust and glue because it can be shaped and sanded when painted it looks the best to me. Not the answer you're looking for? Browse other questions tagged doors trim or ask your own question. Can I re-shim the strike side of my door jamb to make a 28" door fit? What parts needed to finish exterior door?